We currently have 1 adult male available for placement. Please email for information. Welcome to Sakuras Sun Devon Rescue and Cattery!! 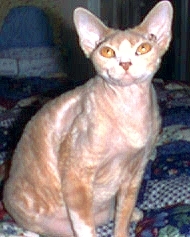 At Sakuras Sun, we offer the beautiful Devon Rex. These cats are very loving and hypo-allergenic. They would be a perfect addition to your family.